The first I heard of this case in was 2004. There was the claim the “pied piper” killer enticed the children to walk a block behind him up into the hills. 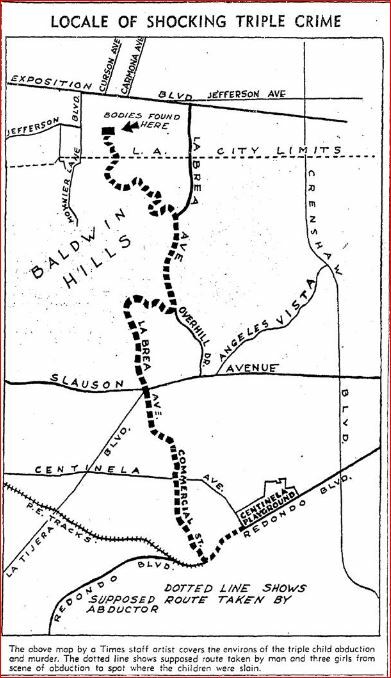 This map by the L.A. Times has the crime scene location 1 1/2 miles farther north than the testimony indicated, at about where Coliseum Street is today. Given this route of 5 miles, that seemed if not impossible then highly unlikely. The parents thought the same and there was a hunt for an old car the girls were seen in at the time. In starts and stops due to it being difficult, these contradictions led to 10 years of research and to the conclusion the wrong man was hanged while the girls’ real killer remained free. Next Next post: Is Texas Going to Execute Another Innocent Person?